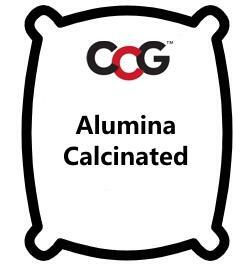 Alumina Calcinated. Also known as Calcined Alumina. Calcined alumina is generally used in the manufacture of high-grade ceramic shapes, refractories and fused alumina abrasives. It can be compressed to produce a fired density of 3.8 or more. Amazingly, ceramic bodies containing 95% or more alumina are being employed to produce ceramic parts for a wide range industries (fired to 1400C or more). Fabrication methods and glazing vary according to application. Alumina has a very high melting temperature (about 2000C) and alumina ceramics can maintain up to 90% of their strength above 1100C. They are thus employed in many refractory materials (i.e. Calcium Aluminate Cements have PCEs above cone 35) and used to make parts that must withstand high temperature. Calcined (or alpha) alumina is made by calcining a source alumina powder at 1200-1300C to convert it to pure Al2O3. This is the densest and most stable crystalline form of alumina. It is insoluble in water but is soluble in hydrofluoric acid and potassium bisulfate. When nearly 100% of the material converts to the large hexagonal, elongated tablet shaped crystals associated with the alpha phase, the product is referred to as "Tabular Alumina". Unground calcined aluminas are typically 100-300 mesh, but much finer grades (often called "Ground Alumina") are produced by milling. Calcined aluminas are available in numerous grades based on the heat treatment applied, crystal size, soda content, and degree of thermal conversion to alpha phase. Soda content is a major factor in determining the final use (low soda materials are used for electronic applications, medium soda for electrical insulation and porcelains, high soda for glass, glaze, fiberglass and electrical porcelain). Although it might seem logical to calculate a chemically equivalent substitute of alumina and silica for part of the kaolin in a recipe (i.e. to reduce glaze shrinkage in high kaolin recipes) this will likely not work unless the alumina is ground to micron sizes (very expensive). This is because the high melting temperature of the raw alumina, it will simply act as a matting agent. Notwithstanding this, alumina is added to glazes in the tile industry to impart matteness and texture (depending on particle size). In addition, for glazes that have alot of melt fluidity, an addition of pure calcined alumina powder can stabilize the melt while maintaining most of the visual effect. Unlike hydrated alumina, the calcined material has no loss in weight on firing. Thus it produces no gases of decomposition. Fired alumina ceramic parts can be harder than tungsten carbide or zircon, two to four times as strong as electrical porcelain, and very resistant to abrasion. Alumina is thus used in grinding media, cutting tools, high temperature bearings, and a wide variety of mechanical parts. Compared to zircon it has a high thermal conductivity and a higher thermal expansion. Alumina (preferably in the calcined form) can be used in clay bodies as an aggregate and filler in place of quartz. This can increase the firing range, decrease quartz inversion firing problems, and increase hardness and whiteness in the fired body. However, alumina is much more expensive.